I know, I know... I haven't posted much lately. Just the normal family life stuff...busy holidays (Easter), busy kid stuff, I've been busy nesting and getting the nursery ready, and have been a very tired pregnant momma when things aren't busy (aka: a momma who reads for six minutes before falling asleep on the couch or watches mindless television-- I just finished Season 1 of Parenthood on Netflix!). For a while anyways. I'll always come back to ya though...eventually. And since my brain doesn't seem to be processing deep thoughts about anything but nursery curtains and whether or not to buy new bottles and car seats, I decided to flip through my I-phone and give you a little "snapshot snippet" of what we've been up to! So here are some piece of our life from the last two weeks in photos! Ella and I visited our favorite little cafe/bakery for lunch. We were playing counting games with the creamers and then decided to build a tower! 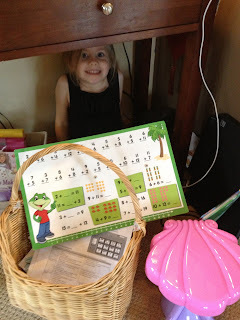 She's been going through a little "I need mommy" stage, probably her 4-year old way of subconsciously saying "hey, spend some time with me before that baby is crying and nursing all the time!" So we went out to lunch the other day and I've been trying to read her a few more books and pay extra attention to her in the spaces that it seems feasible. Ella's favorite thing to do in the car with her umbrellas...she builds a tent and hangs out inside! Me, earlier this week...37 weeks preggo!! 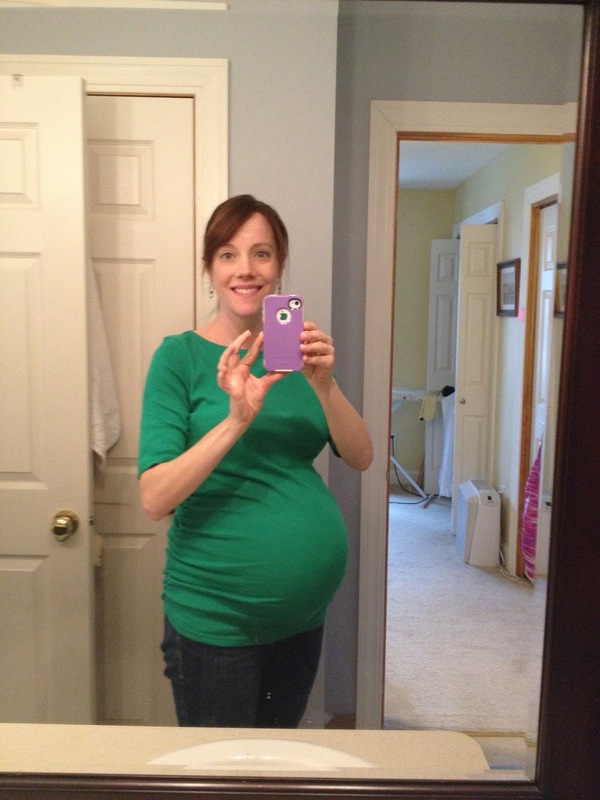 Due date is swiftly approaching! Ella and I have been doing all sorts of counting activities lately...it's funny the things you end up teaching and working on with your second child that you never would have with your first...like who knew that 4 year olds could count by 10's to 100?! 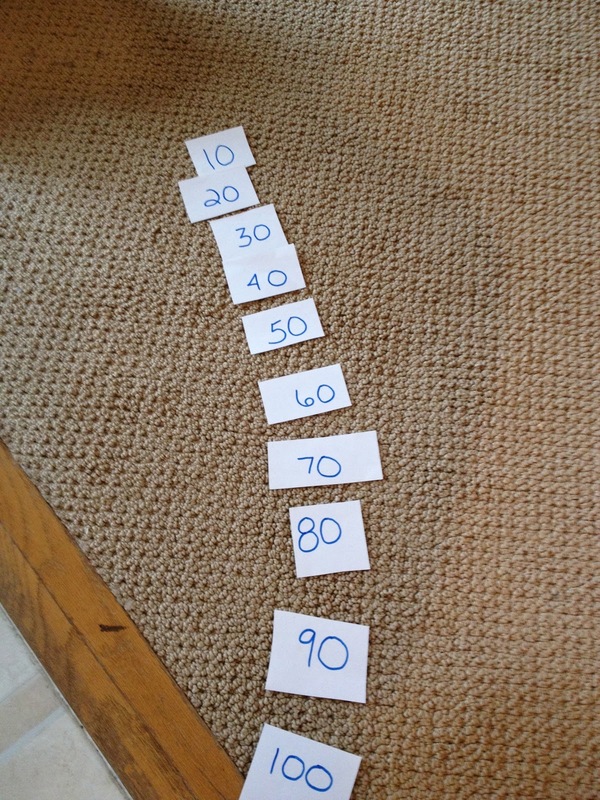 I know, it's the little things, but Ella is one smart little cookie in the number department...So I made these flashcards today.... mixed them up, put them on the floor and she whipped them in to order in a matter of seconds. Go Ella! 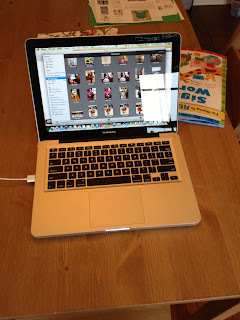 For the record...how long do the rest of you seem to get out of your laptops?! I'd like to get 4-5 years...is that possible? Daddy volunteers ONE day in Ava's classroom and gets a thank you sign from the entire class!!! I've been in at least six times this year...no sign for momma! Want to know why? Scott wins everyone over with his best love language...donuts. 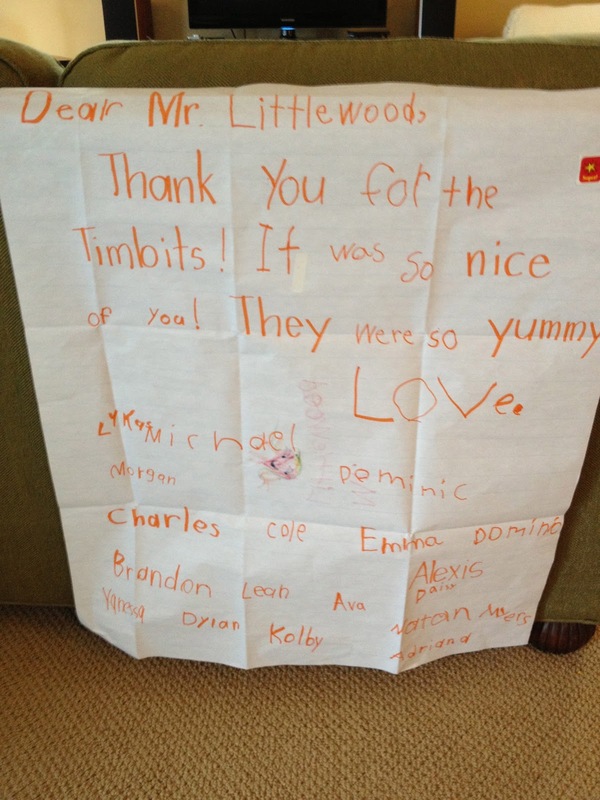 That's right, he was the only parent all year to bring in Timbits (Tim Hortons munchkin donuts) on the day he was volunteering...the class LOVED it. Pretty cute, huh? I'm an avid label reader...problem is I often don't read them until I get home and am ready to make something for dinner. 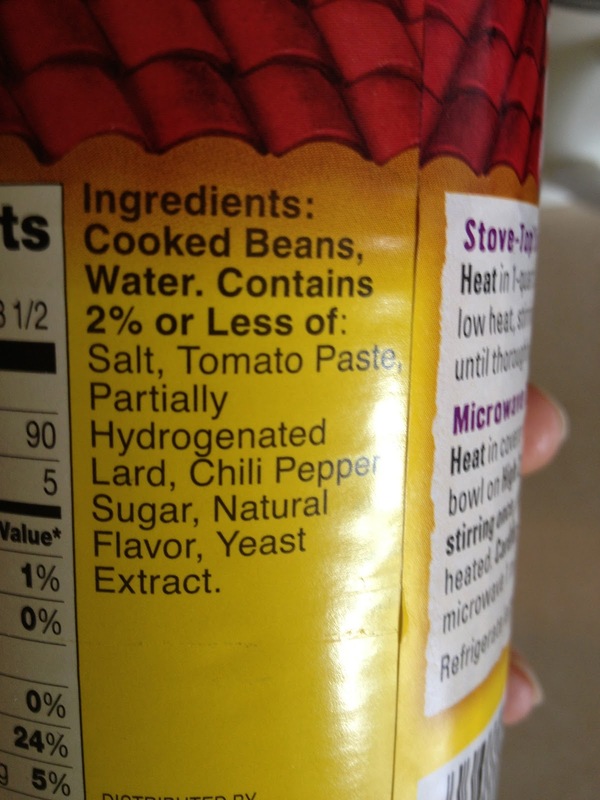 Imagine my surprise when I discovered PARTIALLY HYDROGENATED LARD listed on this can of refried beans. Ewww! They went right into the trash...Refried bean buyers- beware! Ella "hiding" from me behind all sorts of stuff this afternoon! 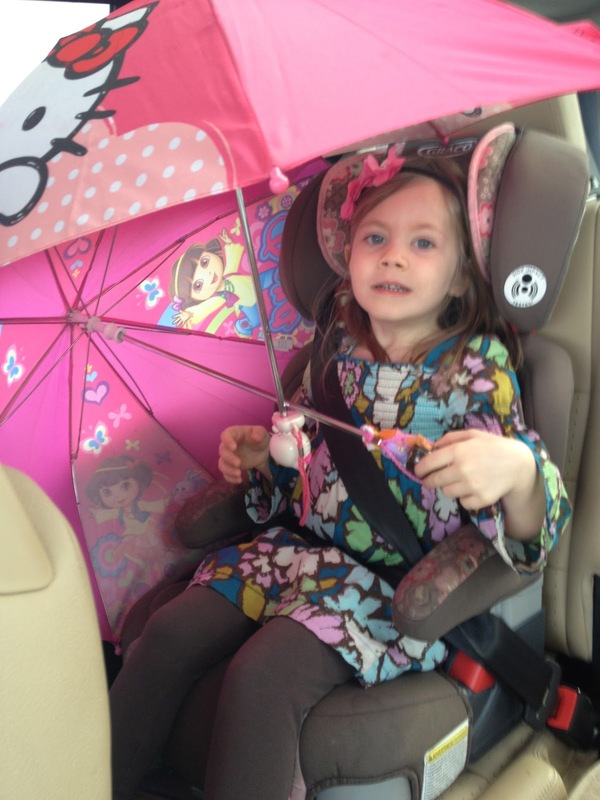 Ava is getting SO big...it's crazy how much they grow up during kindergarten-- physically and emotionally. Oddly enough, I don't have any current pictures of her on my phone. I spend so much time with Ella during the day and by the time Ava gets home from school I get caught up in the evening dinner, bath, spend time with her, bedtime shuffle. She's got these crazy long legs and mature ways of saying things and doesn't look like a "little" kid anymore. I know she's going to be a big help when the baby comes-- she LOVES to kiss my belly and say hello to the baby. Besides meeting the baby myself I'm most looking forward to having the girls meet her to see their reactions. Other than that it feels a little like the calm before the storm in Littlewood Land. I told Scott yesterday that I actually felt a little "lost" and like I didn't know what to do with myself. I've stopped going to the gym (about two weeks ago when I felt like lugging this belly around all day was exercise enough! ), I'm wrapping up most of the small writing projects I've had, the nursery is just about ready and I've cleaned many of the nooks and crannies around the house (not all, but enough to make me happy!). So, I run a few more errands, and find another drawer to clean and give Scott crazy 'honey do' jobs...like cleaning garage (something my nesting instincts want done, but I can't do!). Waiting makes me antsy. And then there is the sometimes nighttime pregnancy insomnia which makes me even antsier (like when I was WIDE awake from 2-4 last night sipping chamomile tea, eating peanut butter toast and putting an Etsy order through for handmade curtain tie backs for the nursery at 3 a.m.). Happy last three weeks, or whatever number of waiting days it turns out to be! 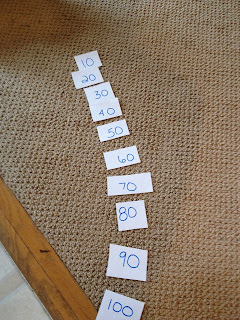 I love the counting by 10s idea. Will try it! And you look awesome. That baby has grown since we saw you! Can't wait to meet her myself. So excited for you guys! Hugs to your cherubs! So exciting!! You're nearly there - Baby #3! I had terrible insomnia the last 6 weeks or so of my pregnancies. I was exactly as you described -- I could go to sleep fine, but then I'd wake up at like 2AM and could not fall back to sleep, so I'd get up and get stuff done. My 1st and 2nd kids would never have had 1st year photobooks without those sleepless nights! Enjoy this calm time and enjoy those newborn days, too -- you know now how quickly they fly by! You have the rest of your life to clean house, but only a very few weeks to enjoy a newborn baby!